There's been a lot of talk lately about the iPod halo effect�the theory that Apple's iPod is drawing Windows users over to the Mac platform. It's a sound theory, if you'll pardon the pun. Once Windows users see how well the iPod and iTunes work, they start to wonder what other goodies lurk on the five percent side of the fence. Permit me to put forth another theory: the iLife gravitational pull. Apple's iLife suite of programs have helped to define what a Mac is and what it can do. I've heard more than one Windows user say things like, "I have to use a Windows computer because our corporate rubber-band inventory system runs on it, but I got a Mac to do all the digital photography and video stuff." But don't take my paraphrased quote for it. Read the words of Alan Lewis, a technical evangelist at eBay. On his blog he writes, "A few months ago, I made the decision that my next computer will be a Mac. I have used Windows or DOS systems since I was a kid, so this is no small change for me.... The main reason I want to buy a Mac is because I need one to run iLife. Sure, the hardware looks cool. Sure, the new Tiger OS has some cool features. And sure, I like my iPod and want more stuff from Apple. But just like how Visicalc helped to sell Apple IIs, the thing that has sold me on getting a Mac is the software that runs on it." That's the iLife gravitational pull. With iLife, Apple has nailed personal digital media production. The Windows platform has programs aplenty, but there's nothing like iLife over there: no suite of five tightly integrated programs that work well and work together and are free with a new computer�a computer that also has all the ports you need for digital media and that's blissfully free of viruses and spyware. An iPod halo effect? No doubt. But I'd bet a Mac mini that the gravitational pull of iLife draws just as many Windows users to the Mac. While you're feeling the pull... Check out the latest edition of the original iLife book. The Macintosh iLife '05 is the best-selling iLife book, and it's the only one that includes a companion instructional DVD that dovetails with the text. Learn more, then order yours for just $23.09 on Amazon.com. There's a lot going on here at Sophie's place, too much to allow for much in the way of updates here. Still, there's news, in case you missed it. iPhoto update. Apple has shipped iPhoto 5.0.4, an update to an update. Version 5.0.4 fixes a bug that was introduced in the short-lived 5.0.3, which fixed a color-related bug that has been causing fits among some Tiger users. I have yet to encounter that color-related bug. My primary iPhoto library is still living on a Panther-based machine; I use this G5 for about 32 hours a day, and I have a lot of stuff hanging off of it: graphics tablet, film and flatbed scanners, two printers, and upwards of a terabyte of storage. And I just don't have time for an adventure in updating right now. My other Macs�a dual-processor G4 testbed machine and my PowerBook�are running Tiger, and are loving it, as am I. One of these days I'll take the plunge on my main box. GarageBand update. On Monday, Apple delivered GarageBand 2.0.2, an update that improves Tiger compatibility (see?) and fixes various bugs. Apple eNews update. Woot! Today's issue of Apple eNews covers the Life Poster for Tiger project that I wrote about earlier this month. And with that, it's back to our regularly scheduled madness. Be good to each other! Don't look now, but here comes another week. I had a busy but fun weekend. The iDay seminar I hosted in Santa Rosa was a blast; we spent over four hours exploring every nook and cranny of iPhoto, dipping into Photoshop Elements and iDVD, and wrapping up with some editing tips for iMovie. My thanks to the North Coast Macintosh User Group, especially Lorene Romero, for their help in making it a fun and successful day. Which brings me to today's tidbits. iDVDThemePAK.com has introduced a new library of menu themes for iDVD. The new Family ThemePAK is a $39US collection of ten themes for iDVD. The themes fall into five largely self-expanatory categories: Mitzva, Home Improvement, Paradise, and Playroom. 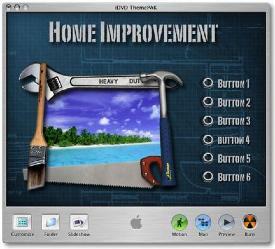 Shown here: the Home Improvement theme, whose faint background blueprints glide gracefully across the screen as the menu plays. iDVDThemePAK.com now offers an even dozen set of menu themes for iDVD. They're all beautiful, and they're a great way to expand your menu design options and go beyond the themes that Apple provides. The company also offers several free themes that you can download; many of them are also included on the DVD that comes with my book. Here's another menu-design tip; this one is from my book, and I demonstrate it on the book's companion DVD. If you've creating a DVD containing some slide shows, why not use one of the photos from the slide show as the DVD's menu background? You can replace a DVD menu background by simply dragging the photo from iPhoto (or from the photo browser in iDVD) into the menu area of the iDVD window. If the current menu theme contains drop zones (those special areas into which you can drag a movie or some photos), the drop zones will remain when you replace the menu background. To remove them, press the Command key while dragging the image into the menu. One problem with this trick is that your photo is likely to overwhelm the text and buttons in your menu. Here's how to make your photo background more subtle. In iPhoto, duplicate the photo, and then open it in iPhoto's edit view. Next, use the Adjust panel's Brightness and Contrast sliders to give the photo a faint appearance. Use this altered version as your menu background. There's more. There's oh-so-much more about iDVD authoring in The Macintosh iLife '05. What's the best way to create a slide show: within iPhoto or within iDVD? How can you ensure reliable burns? What's the easiest way to move buttons from one menu to another? How do you create your own motion menus? It's all there, in 345 full-color pages and a two-hour, 43-minute instructional DVD. It's the world's best-selling iLife book, and it's yours for $23.09 on Amazon�34 percent off the cover price. Learn more, then order what one reviewer called "the best computer book ever, bar none." I'll be in the car for several hours tomorrow as I drive to and from the iLife seminar that I'm doing in Santa Rosa, CA. We have a nice crowd (but a few seats left!) and it's going to be a blast. 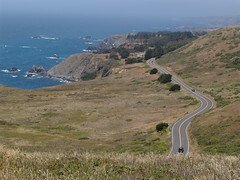 And the drive is beautiful: it begins on the stretch California's famous Highway 1 that you see here, then continues for 56 twisting and turning miles�through a redwood grove, then through the vineyards of Anderson Valley and past towns with populations in the double digits. My kind of places. Then it's onto Highway 101 and into Sonoma County and progressively thicker development and traffic. Sonoma County used to be a rural paradise. Much of it is still spectacular, but it's also a great place to be a bulldozer. I'll also snag their interview with James Randi, another of my pseudo-science-debunking heros. Between these shows and a couple of podcasts of Harry Shearer's Le Show, I'll have plenty of company for the ride. If you're looking for some weekend listening, start with the links I've provided above. Or download the archive of the radio show I did on Wednesday. After a brief salute to the tenth anniversary of the .MP3 file extension (hey, it's a geek show), we shifted to maps, GPS, and the growing "location-based" industry. My guests were Rich Owings, author of Make Your Own Maps, and Nathan Torkington, co-chair of O'Reilly Media's Where 2.0 conference. Point & Click Radio isn't yet available as a podcast (gonna do it! ), but in the meantime, you can snag the MP3 archive (12MB) right here. On his Cult of Mac blog, Wired News' Leander Kahney reports on yet another sighting of the San Francisco Apple Store "squatter." A correspondent sent some cell phone photos that do indeed show the woman who I wrote about last month (and erroneously identified as a man�I'm a geek, Jim, not a doctor). There's a cool "game" afoot on Flickr: it's called Infinit Flickr, and it involves taking "a picture of someone using flickr to see a picture of someone else using flickr to see a picture of someone else using flickr to see a picture of someone else using flick to see a ...... ad infinitum." Cooler still is this movie interpretation of the game's images, created by (of course!) a Flickr member. Item 1: My review of Apple's DVD Studio Pro 4 is now online on Macworld's Web site. Item 2: Last night's radio show about GPS and "location-based technologies" was a blast. I'll post an archive as soon as I have time to fine-tune the audio file. Item 3: The Flickr spammer I reported on the other day is no more. Flickr has sent her account to that great spam bucket in the sky. On tonight's edition of Point & Click Radio, we'll be talking location, location, location. That is, we'll be exploring the world of GPS. It has led to an explosion of cool Web applications, including the ability to make your own maps. My guest in the studio will be Rich Owings, author of GPS Mapping: Make Your Own Maps. And I'm putting out a request: Rich's book is very Windows-centric, and there's a (sad) reason for this: much of the cool location-related software that's out there is available only for Windows. But I know there's cool GPS and mapping stuff available for the Mac, and if you're a GPS guru who uses a Mac, I'd like to get you on the air tonight to talk about it. Email me and let's set it up. Point & Click Radio airs at 7 pm Pacific time on KZYX and KZYZ, Mendocino County Public Broadcasting. We simulcast live via RealAudio, and an archive of the show will be available within several days. Update: I'm happy to say that we'll have a second guest during the second half of the show: Nathan Torkington. Nathan was co-chair of O'Reilly Media's Where 2.0 conference, which took place last month and, true to its name, is all about location-based technologies and services. It should be a great show, so tune (or stream) in! Here's a quick follow-up tip to the Life Poster project I presented earlier this month. Once you've made that big honkin' poster, you can do more than "just" order a 20 by 30 inch print of it. You can also bring it into iMovie HD and let Ken Burns have his way with it. 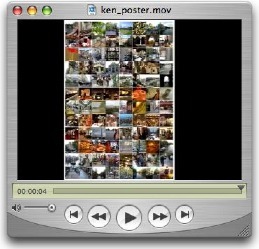 Use iMovie HD's Photos button to bring the poster into iMovie HD, and then adjust the Ken Burns settings as desired. Start zoomed in on just a few photos, then zoom out to reveal the entire poster. See for yourself: Watch the movie (846K). However you apply it, adding some motion to your life poster can be a cool way to start or finish a movie montage. Boss Ken Burns around. There's so much more you can do with Ken Burns, and you'll find all of it in The Macintosh iLife '05, the latest edition of the world's best-selling iLife book. And because this is the only iLife book that includes a companion instructional DVD, you can also see the techniques you read about. 345 full-color pages and a two-hour, 43-minute instructional DVD: yours for $23.09 (34 percent off) on Amazon.com. Order that baby! See for yourself this Saturday. Live in the San Francisco Bay Area? Join me in Rohnert Park for iDay Afternoon, a four-hour seminar devoted to iLife, Photoshop, and more. Learn more. I suppose it was inevitable. Over the weekend, a blatant case of Flickr spam appeared. This Flickr member has uploaded exactly one "photo," and it's a lame advertisement for Web design services. After creating this "photo", the spammer added it to several Flickr photo pools, including the Macintosh pool. And look! This discussion thread points out that the photo's imagery is ripped off from Corbis: you can see the Corbis watermark across the illustration. Ah, but let us revel in the Flickr community: Other Flickrites have added some pretty funny tags and comments to the photo. You can't do that with email-based spam. The spammer is 27, female, and single, and based in Dubai, UAE. 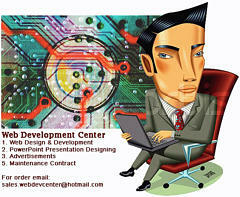 "And our slogan is High quality, challenging projects, so challenge us we love challenging projects as well as we keep our promises and time keeping." Ah, Monday! Are we awake yet? Here's an iPhoto tip that might help open your eyes. It's from my book, and it deals with assigning titles and comments to photos. You've just imported a set of photos into your iPhoto library, and because you're organized and tidy, you want to assign titles and descriptions to each one, or at least to the best ones. There's a great keyboard shortcut in iPhoto 5 that lets you assign titles and descriptions to one photo after another without having to reach for the mouse. First, display the Information pane by clicking its button (the little "i") near the lower-left corner of the iPhoto window. Next, click on the first photo you want to title. 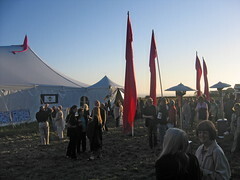 Jump down to the Information pane, and type a title�for example, Mendocino Music Festival. Now press Shift-Tab to move immediately to the Comments area of the Information pane, and type your comments. So far, so obvious. Now here comes the slick keyboard shortcut. To jump to the next photo, there's no need to reach for the mouse. Just press Command-] (that's the right bracket key, just above the Return key). 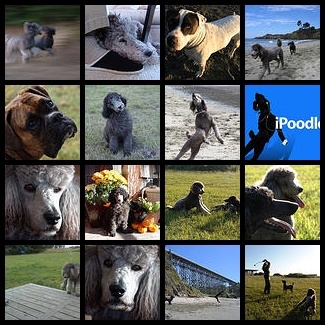 iPhoto selects the next photo in the list, and you're ready to start typing and tabbing again. To select the previous photo, press Command-[ (left bracket). So What's the Flickr Angle? Simply this: if you assign titles and comments in iPhoto, and if you use Fraser Speirs' free Flickr uploading plug-in to upload photos to Flickr, your titles and comments will be transferred to Flickr when you upload. It's the easiest, most efficient way to assign titles and descriptions to your Flickr photos. The uploader will also turn iPhoto keywords into Flickr tags, making it easier to assign those all-important tags to your Flickr shots. "Apple should bundle this book with its iLife suite." So says the latest review of my book on Amazon, and by golly, I agree. Until that happens, though, you can buy the world's best-selling iLife book (and its two-hour, 43-minute instructional DVD) for just $23.09�34 percent off the cover price. Order The Macintosh iLife '05 today. Let's spend next Saturday together! Don't forget, Bay Area residents, Saturday July 23 is iDay Afternoon: a four-hour seminar that drills into iLife, Flickr, Photoshop, and much more. Learn more, then sign up! If you live in the San Francisco Bay Area (particularly in the North Bay), mark your iCal calendars: On Saturday, July 23, I'll be hosting a half-day seminar devoted to iLife, Photoshop, and more. It's a variation of the acclaimed iDay Digital Media Seminars that I've hosted in past years at Macworld Expos, at the Los Angeles Convention Center, and other locations. It's called iDay Afternoon, and it's an intimate (about 25 attendees maximum) and intensive look at iLife '05 and digital media, with an emphasis on iPhoto and Photoshop Elements and CS2. Just you, me, and handful of a other iLife lovers for four hours of tips, techniques, questions, answers, and laughs. iDay Afternoon takes place from noon to 4:30 pm at the Rohnert Park Senior Center in Rohnert Park, California (just south of Santa Rosa). Registration costs $49. I'm doing this in partnership with the North Coast Macintosh User Group, which gets 30 percent of the proceeds. We have fewer than a dozen seats left, so if you're interested, sign up now. I hope to see you there! Everyone's talking about podcasting these days, but the concept of Internet radio is hardly new. Back in 1994 and 1995, yours truly produced a monthly show for macworld.com called "Radio Macworld." It was 20 minutes of interviews and news, streamed via RealAudio 1.0. The audio sounded like a muffled phone call. Back then, kids, we had to prepare audio so that it would stream on a 14.4kbps modem. The other day, I stumbled on another treasure trove of old Internet radio: the Geek of the Week series produced by Martin Lucas and distributed by O'Reilly & Associates. They're a great trip down Internet memory lane. In this gem, from October 27, 1993, a guy named Tim Berners-Lee talked about "the World Wide Web, one of the most innovative and exciting applications to be deployed on the Internet." I'm listening to it as I type this, and Tim just mentioned how they can use a hard-copy teletype machine as a browser. I don't think there's a lot of that going on anymore. The Geek of the Week archives are still available in RealAudio streaming format, but you can also download them in .AU format. iTunes won't natively play .AU files, but you can open them in QuickTime Player and, if you have QuickTime Pro, export them in an iTunes/iPod-compatible format. And those old episodes of Radio Macworld that I produced? I have them on a Zip disk somewhere, and one of these days, I'll connect my SCSI Zip drive to my Quadra 840AV and bring them into the modern age. Which, I'd be willing to bet, won't seem all that modern in 12 years. Still streaming after all these years. Don't miss tonight's edition of Point & Click Radio, the weekly show that I co-host with my friend Bob Laughton. The show airs (and streams) tonight at 7 pm Pacific time. And we'll be podcasting soon! First, a couple of tidbits relating to the life poster project I published last Friday. Having problems making a poster? If you get an error message when running the workflow, be sure that you've selected only JPEG, TIFF, or PNG images in iPhoto. The workflow won't work with other formats, such as raw. Creating photo mosaics through Flickr. There's always a Flickr angle, isn't there? 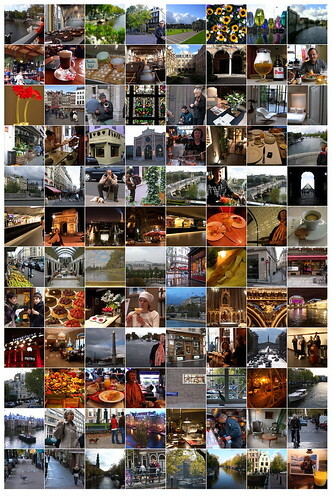 Programmer John Watson has created a Web application that enables you to make a photo mosaic from any public photos on Flickr. Just enter the Flickr URL for each photo. Better yet, supply a Flickr URL that points to a collection of photos (such as your favorites, somebody else's favorites, or a set, Flickr's equivalent to an iPhoto album). I made the mosaic you see here in about 8 seconds. The mosaics aren't large enough for high-resolution printing, but they're great for posting on Web pages (including, of course, Flickr) and sending via email. Now (not) on newsstands: VR Magazine's Summer 2005 issue. Here's a magazine you won't find at your dentist's office. VR MAG is a Web-based periodical that covers the entire QuickTime VR scene. The Summer 2005 issue is out now, and it's a must-see for anyone interested in QuickTime VR and cutting-edge photography. The new issue features virtual tours of several Mayan cities, of Stonehenge, of Lugano, Switzerland, and�wait for it�of the inside of a dishwasher. Now I know how my plates feel. Frequent listeners to this broadcast will recall last month's post about a Windows user who appears to be all but living in the theater of Apple's San Francisco retail store. 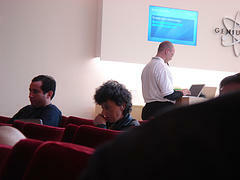 Last week, my Macworld colleague Dori Smith wrote to let me know about the adjacent photo on Flickr. The photo, taken on July 7, appears to show the same person: same hair, same earbuds. And it appears that he is a she. Her tenure at the store is now approaching at least one month. Given that the average monthly rent for an apartment in San Francisco is currently about $1700 (not including wireless Internet access), I'd say she's getting a pretty good deal. No, this site isn't turning into a Flickr blog. But I am awfully fond of the photo-sharing site, and on tonight's edition of Point & Click Radio, Bob Laughton and I will be talking to Bryan Partington, who is traveling across North America and meeting Flickr users and (of course!) taking photographs along the way. Earlier this week, I posted the photo shown here on Flickr. That's me sitting on my sister's lap; these were taken around 1967. The original was horribly faded, and I'd always wanted to scan and restore it. In the course of exploring the Web for information relating to photo booths, I came across The Photobooth Blog. If you've ever ducked into a photo booth for a quick snapshot (and maybe a smooch), you'll dig this site. I want a photo booth of my own. Back to work; don't forget to listen to Point & Click Radio tonight! Happy Fifth of July! To mah fellow 'maricans, I hope your July 4 celebrations were enjoyable ones and that your hearing is still intact. 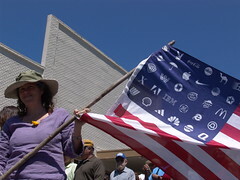 Me, I headed eight miles north to the town of Mendocino for its oh-so-special July 4 parade. And, of course, I shot photos, which now live in their own set on Flickr. I met up with my friend and eBay coauthor Toby Malina and her entourage, and a beer-soaked time was had by all. Judging from Flickr's Tags page, I wasn't alone in photographing July 4 festivities. Tags such as fourthofjuly are among the most heavily used on Flickr in the last 24 hours. But what if you want to search for other criteria? For example, what if you want to search for all photos taken with a specific model of camera? Maybe you're considering buying one and you'd like to see some sample shots. Or maybe you'd like to make contact with folks who use the same gear. You can't do this kind of search within Flickr, but you can do it using a search site you've probably heard of: Google. Just add the site:Flickr argument to your search query. For example, to locate all photos taken using a Sony DSC-F828, use this query: "taken with a sony dsc-f828" +site:flickr.com. How does Flickr know what camera was used for a shot? Metadata, baby. Flickr, in its brilliance, makes this data available to Google's search spiders, and that makes it available to all of us. And because Google ranks pages in part based on their popularity, you'll see the most popular photos from that brand of camera at the top of the list. Want to do a search of Flickr photos that were taken at a high ISO setting, such as 1600? That gets a little trickier, though the query +iso +1600 +site:flickr.com works pretty well. You can also search for photos taken on a specific date�even if the photographers weren't courteous enough to tag the photos. Who shot photos on Valentines Day? The query "taken on february 14, 2005" +site:flickr.com tells all. Metadata: it's the 21st Century equivalent of turning a photo upside-down and writing the technical details on the back. Combine it with the might of Flickr and Google, and you have a global photo album. As I say in the iPhoto segment of my book's instructional DVD, "Is this a great time to be a photographer, or what?" Ah, it's the start of a three-day weekend here in the US of A. Before you go off and damage your hearing with fireworks, here are a few pixels worth reading. Like millions of Mac users, I've gotten some great tips from Rob Griffith's macosxhints site (now part of Mac Publishing, the company that publishes Macworld). But there's one problem with user-submitted tip sites, and it's one that is by no means specific to macosxhints: some of the tips are, well, not so good. A tip that appeared yesterday is a perfect example. The writer, who chose to remain anonymous (red flag! ), wrote: For a long time now, I've wanted to convert my "old" and "outdated" MP3 files into AAC format -- mostly just to free up some space. I have put this off because manually doing this for every song seemed like such a massive undertaking that it didn't even seem worth it. Automator makes this task pretty simple. The moment I read this, my neighbors heard a blood-curdling noooooooooo emanate from my studio. Converting from MP3 to AAC is the last thing you'd want to do if you care about the sound quality of your music. Both formats are lossy: both discard audio information in the interest of making smaller files. An MP3 file has already been through the compression wringer; convert it into AAC, and you compound the sonic damage. Now, if your favorite band is The Bleeding Eardrums and you've been listening to them for years with the volume turned up to 11, you may never notice the additional audio degradation. But if you have a decent set of horns and you listen using good equipment, you certainly will. Cymbals and strings will take on a slightly swirly distortion. Classical musical will sound a lot less classical. Just say no. Don't do it. Never convert one lossy format into another. It isn't worth any modest gains in disc space. iTunes and the iPod family are quite happy with both MP3 and AAC formats. There's no need to standardize on one. iTunes can convert existing MP3s to AAC, but you'll lose quality in the process. That's because both AAC and MP3 are lossy formats: each discards audio information in order to save disk space. Thus, when an MP3 file is compressed with AAC, the lossiness is compounded. Bottom line: To take advantage of AAC�s space savings, re-rip your original CDs instead of recompressing existing MP3s. This re-ripping requirement also applies if you want to take advantage of the Apple Lossless encoder introduced in iTunes 4.5. You can�t convert an MP3 (or an AAC) file into Apple Lossless and gain the quality benefits of the latter�the sonic damage has already been done. iTunes has some smarts that make re-ripping less laborious: If you re-rip a CD that iTunes already has in its library, iTunes tells you that the songs have already been imported and asks if you want to import them again. Thus, you�re spared from having to rebuild your playlists, retype any song information, or manually delete your old MP3s. Note: If you�ve edited a song's information�changed its name or that of the artist or album as described on page 26�iTunes won�t recognize that you�re importing it again, and you'll end up with two copies of the same song. To avoid this, make the same edits before you import the CD, or edit the song information of the existing MP3s to match that of the audio CD. Or just make a mental note to delete the old MP3 files after re-ripping. NASA's Deep Impact probe is expected to slam into comet Tempel 1 on Sunday night at about 10:52 pm Pacific time, and the word is that we Earthlings might see a little show at around 11 pm, skies permitting. Today's San Francisco Chronicle has a good article on Deep Impact, and NASA TV has published a schedule of its comet impact coverage. It all sounds great, and I'll have my beak pointed skyward, but I'll be thinking back to comet Hale-Bopp the entire time. We had a spectacular view of that comet back in the last millennium, and used to watch it set into the Pacific Ocean night after night. Now that was a show. Have a good weekend, mah fellow 'maricans, and remember, if you value your hearing, avoid the fireworks. And avoid converting MP3 into AAC. Deep iLife impact, now 34 percent off. The world's best-selling iLife book�and the only one with a two-hour, 43-minute instructional DVD�is only $23.09 at Amazon.com. Order The Macintosh iLife '05 today.